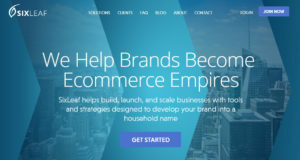 Ecommerce has been around for a few years, but it is still a vastly new industry in its infancy and its potential still far outweighs implementation. This is why tools and expertise are so in demand. From neophyte sellers to experienced veterans, everyone in the landscape is learning as they go. 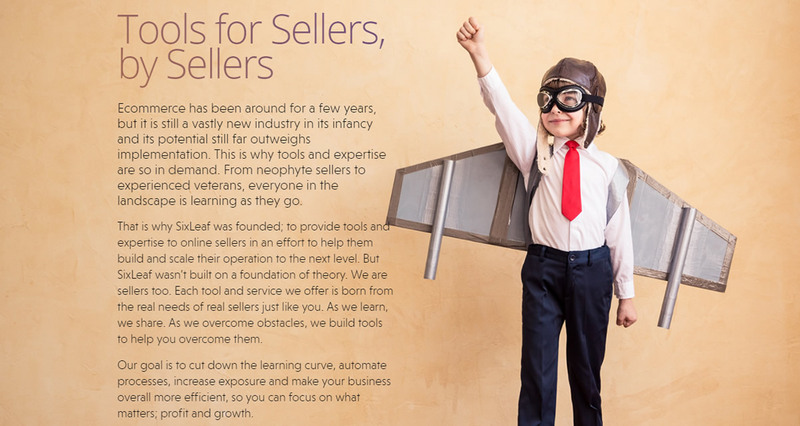 That is why SixLeaf was founded; to provide tools and expertise to online sellers in an effort to help them build and scale their operation to the next level. But SixLeaf wasn’t built on a foundation of theory. We are sellers too. Each tool and service we offer is born from the real needs of real sellers just like you. As we learn, we share. As we overcome obstacles, we build tools to help you overcome them. Our goal is to cut down the learning curve, automate processes, increase exposure and make your business overall more efficient, so you can focus on what matters; profit and growth. 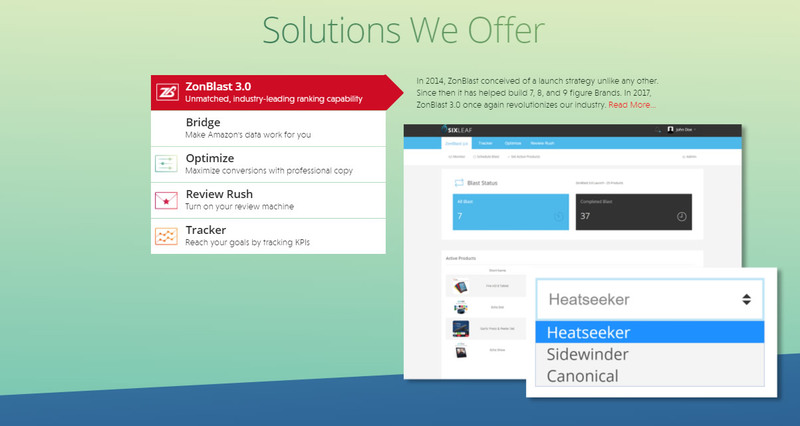 In 2014, ZonBlast conceived of a launch strategy unlike any other. In January 2015, we embarked on our first formal case study. The goal: kickstart Doug's brand to massive success in 30 days or less. We blew past that goal and achieved something we weren't expecting: in 30 days we took Doug from no brand to $1k per day. 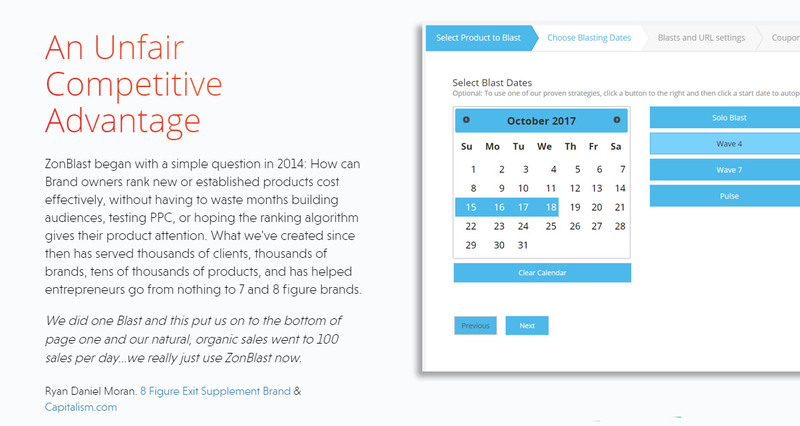 ZonBlast began with a simple question in 2014: How can Brand owners rank new or established products cost effectively, without having to waste months building audiences, testing PPC, or hoping the ranking algorithm gives their product attention. What we've created since then has served thousands of clients, thousands of brands, tens of thousands of products, and has helped entrepreneurs go from nothing to 7 and 8 figure brands. 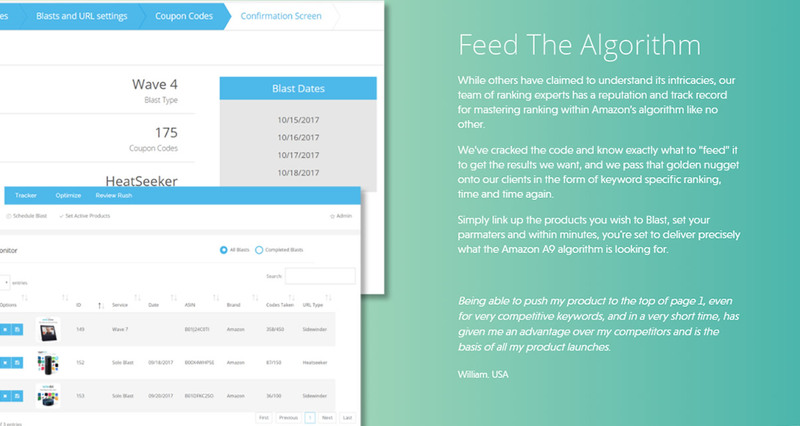 While others have claimed to understand its intricacies, our team of ranking experts has a reputation and track record for mastering ranking within Amazon’s algorithm like no other. We’ve cracked the code and know exactly what to “feed” it to get the results we want, and we pass that golden nugget onto our clients in the form of keyword specific ranking, time and time again. 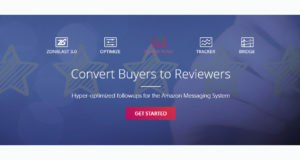 Simply link up the products you wish to Blast, set your parmaters and within minutes, you're set to deliver precisely what the Amazon A9 algorithm is looking for. 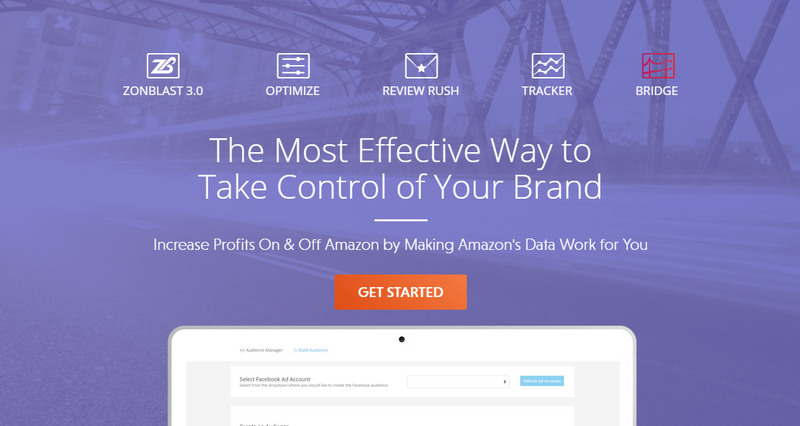 Since 2014, ZonBlast has developed every viable launch strategy on the market and has helped drive 6, 7, 8, and even 9 figure Brands to success on Amazon. 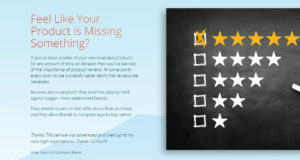 One of Amazon’s main advantages is that they take painstaking steps to ensure the highest quality customer experience. Bridge by SixLeaf does precisely that. 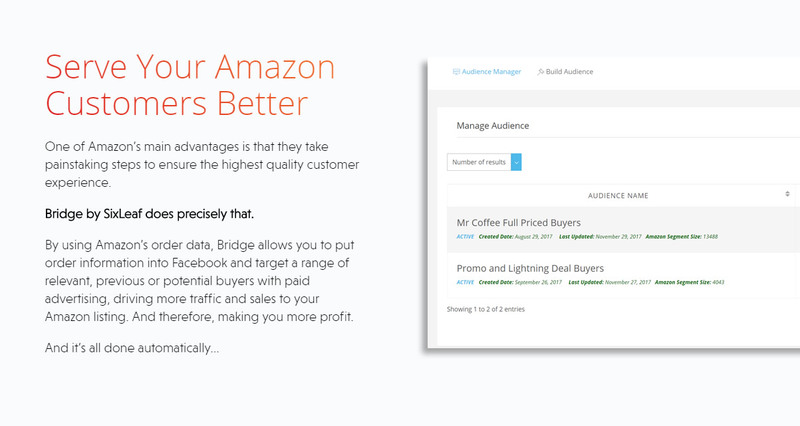 By using Amazon’s order data, Bridge allows you to put order information into Facebook and target a range of relevant, previous or potential buyers with paid advertising, driving more traffic and sales to your Amazon listing. And therefore, making you more profit. 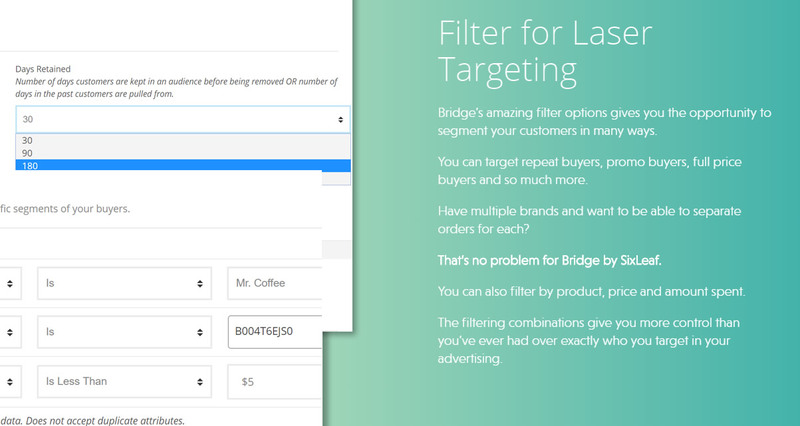 Bridge’s amazing filter options gives you the opportunity to segment your customers in many ways. 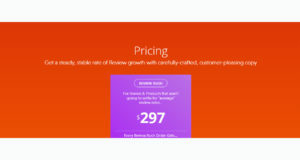 You can target repeat buyers, promo buyers, full price buyers and so much more. Have multiple brands and want to be able to separate orders for each? That’s no problem for Bridge by SixLeaf. 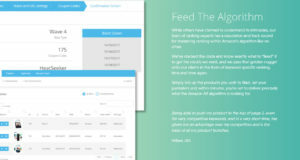 You can also filter by product, price and amount spent. 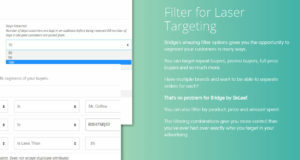 The filtering combinations give you more control than you’ve ever had over exactly who you target in your advertising. 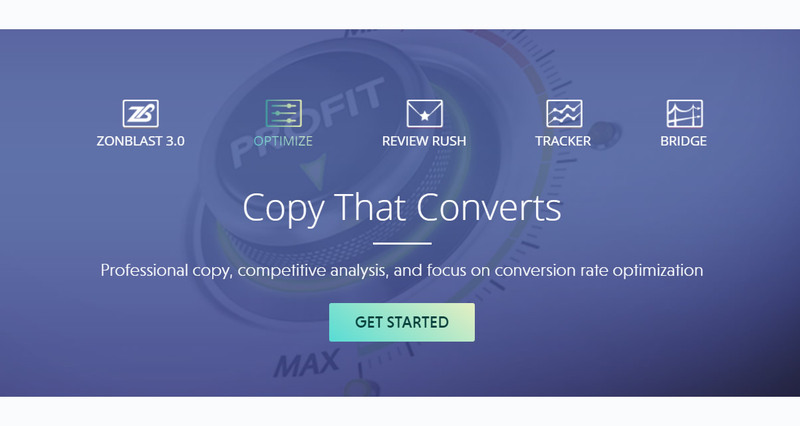 Professional copy, competitive analysis, and focus on conversion rate optimization. 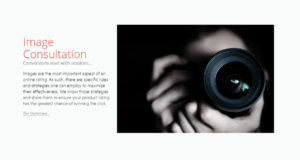 Images are the most important aspect of an online listing. As such, there are specific rules and strategies one can employ to maximize their effectiveness. We know those strategies and share them to ensure your product listing has the greatest chance of winning the click. Leaving money on the table is never good for business. Sales copy isn't just words on a page. It appeals to emotion, induces action, and, done right, produces long-term results and sustainability. 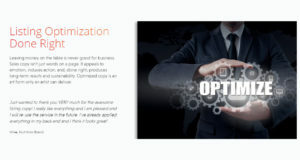 Optimized copy is an art form only an artist can deliver. 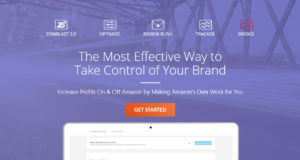 Get professionally written copy, customized to your brand or product so your customers can genuinely connect with your company. The personal, personable touch of your new email sequence conveys to buyers that they are being cared for and are appreciated…and it hits just the right triggers to elicit response in the form of feedback and reviews. Feel Like Your Product is Missing Something? 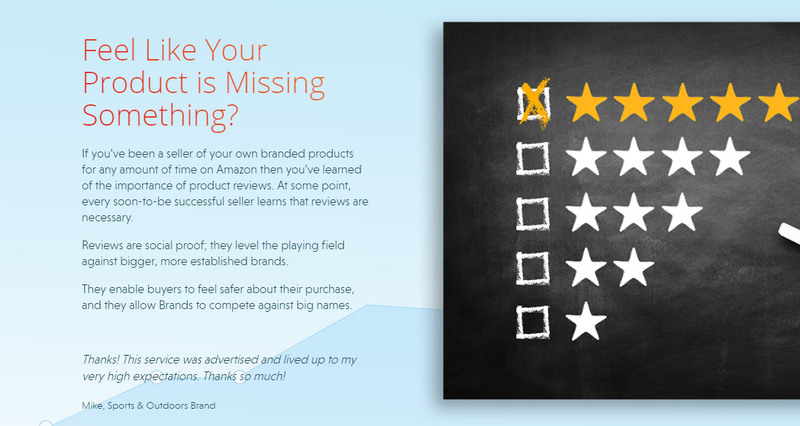 If you’ve been a seller of your own branded products for any amount of time on Amazon then you’ve learned of the importance of product reviews. At some point, every soon-to-be successful seller learns that reviews are necessary. 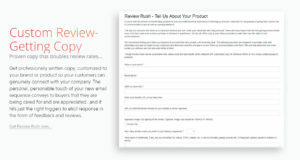 Reviews are social proof; they level the playing field against bigger, more established brands. They enable buyers to feel safer about their purchase, and they allow Brands to compete against big names. So We Just Need More Reviews? 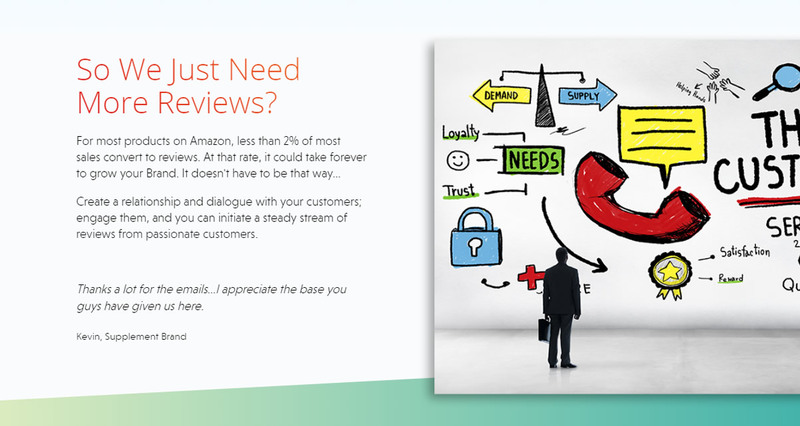 Create a relationship and dialogue with your customers; engage them, and you can initiate a steady stream of reviews from passionate customers. 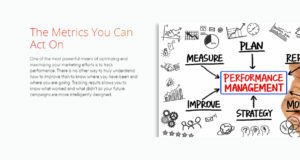 One of the most powerful means of optimizing and maximizing your marketing efforts is to track performance. There is no other way to truly understand how to improve than to know where you have been and where you are going. 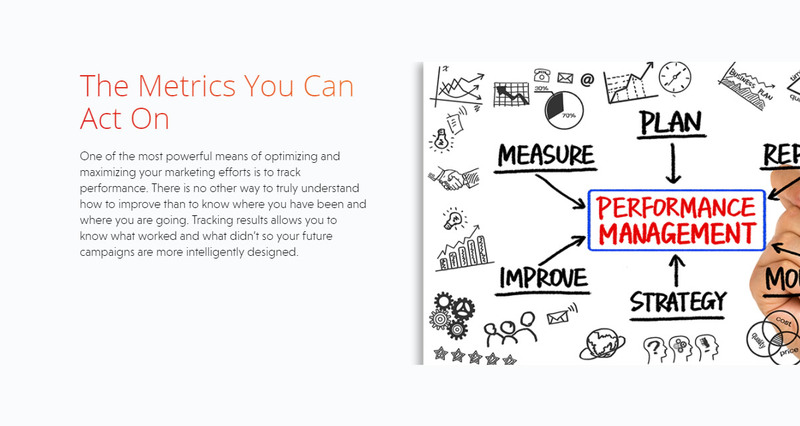 Tracking results allows you to know what worked and what didn’t so your future campaigns are more intelligently designed. 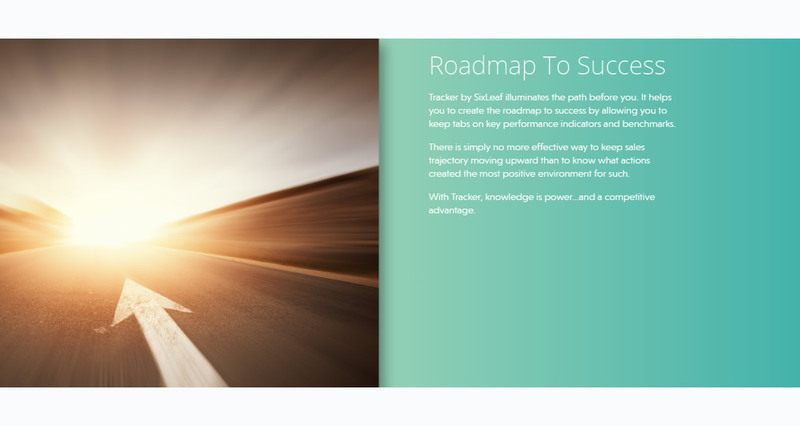 Tracker by SixLeaf illuminates the path before you. It helps you to create the roadmap to success by allowing you to keep tabs on key performance indicators and benchmarks. 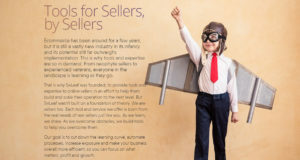 There is simply no more effective way to keep sales trajectory moving upward than to know what actions created the most positive environment for such. With Tracker, knowledge is power…and a competitive advantage. ZonBlast was created in the summer of 2014 by our Founder & CEO, Joe Junfola. 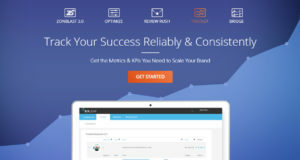 ZonBlast centered on utilizing tested strategies and tactics designed to gain exposure for your products and brand, and to help scale your brand at a rate that was previously impossible. ZonBlast created the "blast" and "launch" space itself, and we've been responsible for introducing the promotion tactics, URLs, tools and more that have helped brands go from nothing to 7 and 8 figures. What is the purpose of a "Blast" or a promotion? 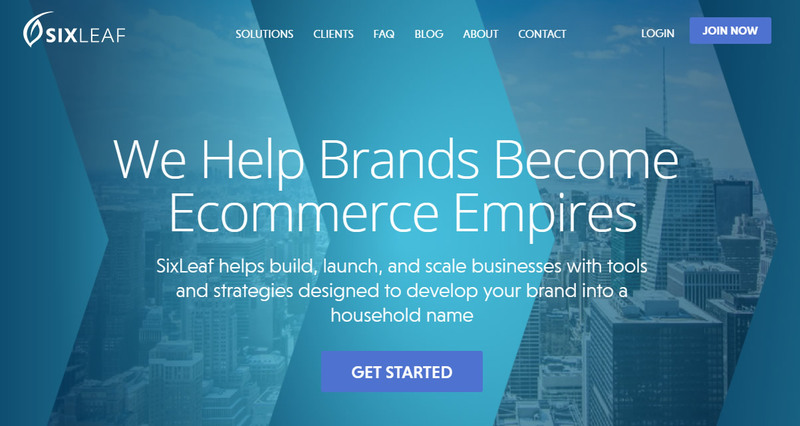 What SixLeaf does for your brand is equal to a black friday sale, or any number of deep discount sales that exist in typical brick and mortar such as grand opening sales or holiday sales. We place your offer in front of one hundred thousand customers hungry for a great deal on an even better product. The result of this is your brand makes a name for itself and gains traction. Is running a promotion safe? 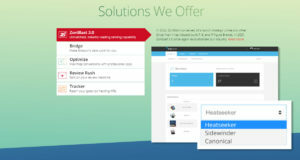 Promotions/Blasts with the ZonBlast 3.0 platform are 100% in compliance with Amazon's ever-changing Terms of Service. 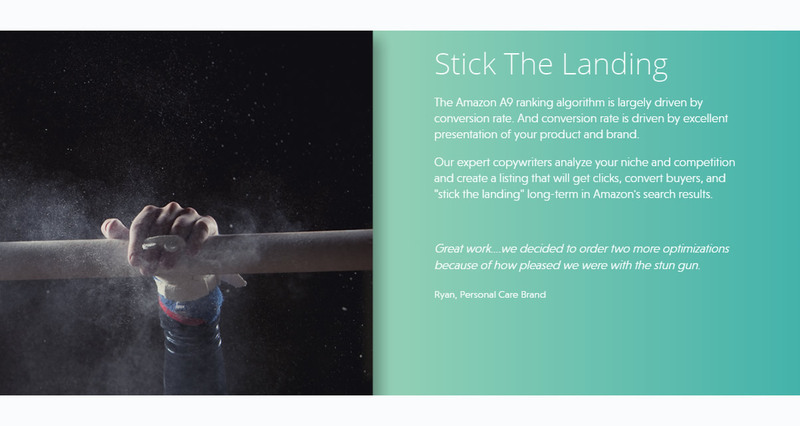 We go above and beyond to make sure everything we do is in compliance with Amazon, and we constantly monitor changes within Amazon to ensure so. How many units do I need to give away for a successful promotion? How many units to give away and duration of promotion is different or every type of product and category. The best way to get started is to send us a link to your listing and from there, we can provide our insight and recommendations based on your listing and competition. Does ZonBlast 3.0 work for other marketplaces? 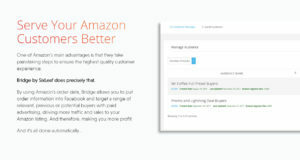 ZonBlast 3.0 currently works with the Amazon US marketplace. We are working to expand into other markets in the near term and will notify our audience via our blog and email when this option becomes available. Can I expect reviews from a Blast? SixLeaf/ZonBlast is not a review service. As we have positioned from day one of our operations, we have maintained the position that requiring reviews in order for buyers to partake in your promotion is outside of both Amazon TOS as well as FTC guidance. 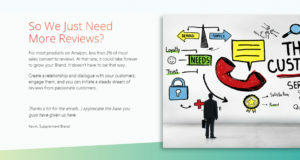 We do not require our deals community to leave reviews, nor do we gate access to future products or otherwise force unnatural reviews in any way from our audience. How soon can I start a promotion? You can get started in just a few minutes and have your promotion scheduled to start within 48 hours of signing up. Upon signup, you will receive instructions & walkthrough videos to get you up and running quickly. Any questions? Hit the blue messaging icon at the bottom right of the screen to get in contact with us. How many promotions can I run? With each product plan, you set the number of days you want your promotion to run for. Whether you want just a few days or several days throughout your billing cycle, it all falls under the same monthly product plan price. 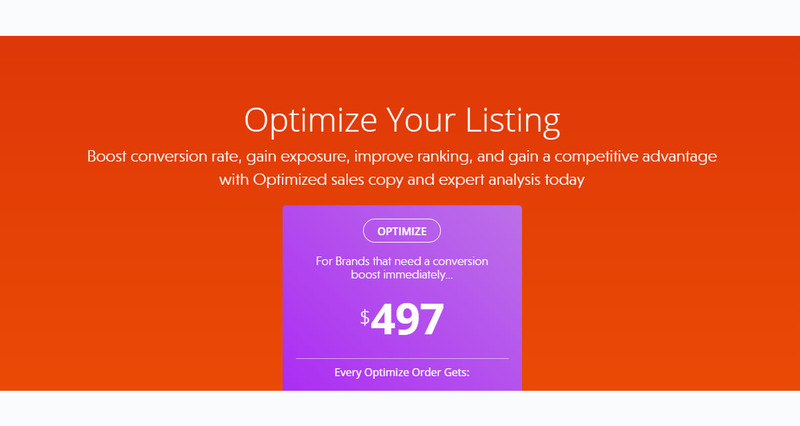 Optimize (formerly ZonOptimize) is a copywriting service which taps into our team's extensive experience in sales and marketing. 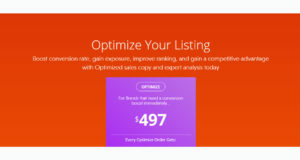 Give us your ASIN and product information and we provide a fully optimized listing, including multiple title options, bullets, description, recommended search terms and more. 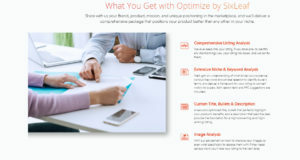 We even advise as to recommendations for pictures as well as price points and competitive landscape analysis. 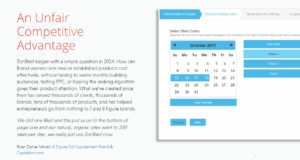 Orders are typically scheduled via a convenient calendar during the order process. You will be able to see the delivery dates available prior to payment. 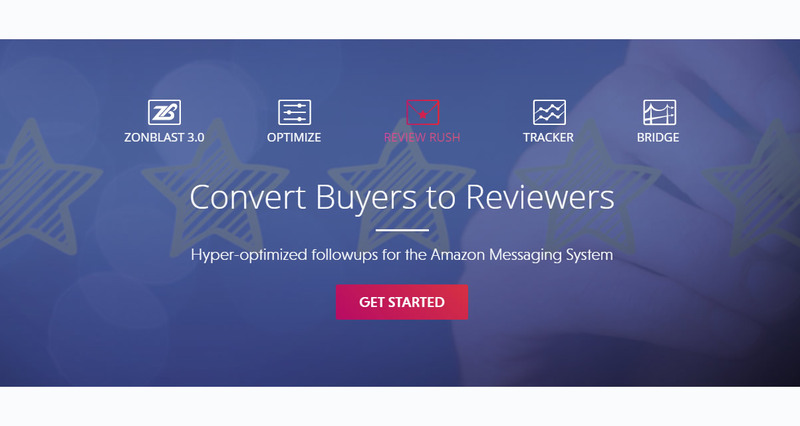 Review Rush is a copywriting service for your Amazon messaging system communications with customers. Using your product and any information you provide, we will write an optimized followup sequence that can then be used inside the followup tool of your choice. Can I see examples of followup sequences that you've written for other brands? 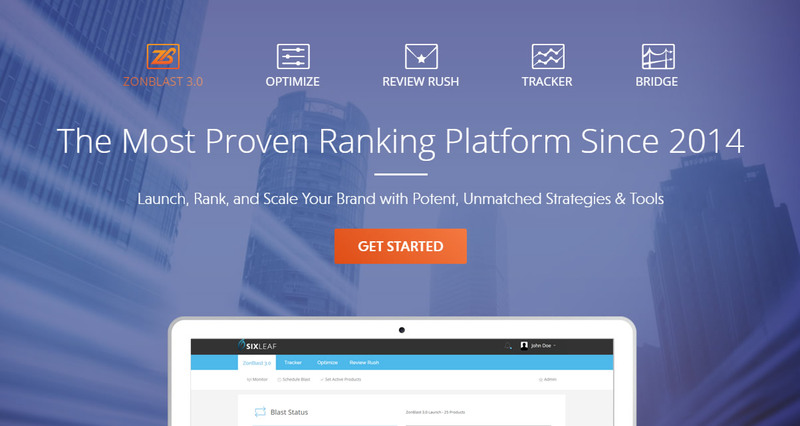 Tracker is our previously-unpublicized rank tracking platform. 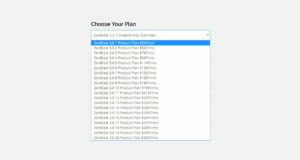 This is including 100% free for all clients on a ZonBlast 3.0 plan. How often is rank updated? Rank is updated once per 24 hours. We also provide you with capability to update rank near-instantly on-demand. This capability is refreshed every 24 hours. Do I have to maintain a monthly subscription? Is there a contract or minimum required commitment? 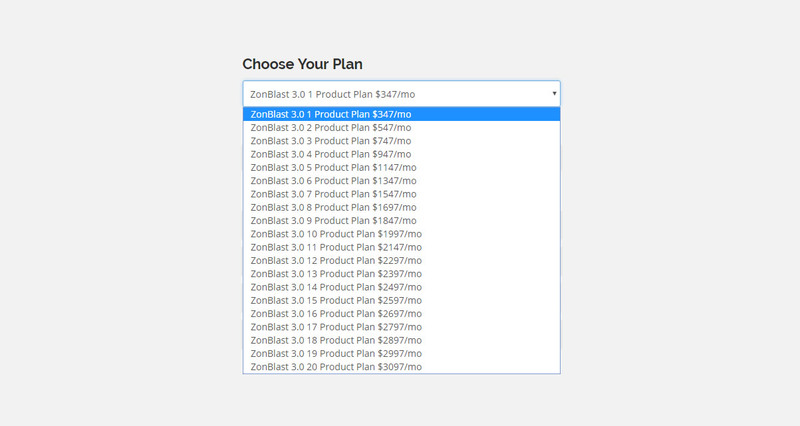 ZonBlast 3.0 – our promotion services – are available via a monthly subscription, but none of our plans require a long-term commitment and you can upgrade/downgrade/cancel your service at any time. We've found that those who repeatedly succeed with us are those who recognize that building their brand is not a one-blast event. We are part of your long-term strategy to launch and scale your products, optimize your listings, and take you from brand to Empire. 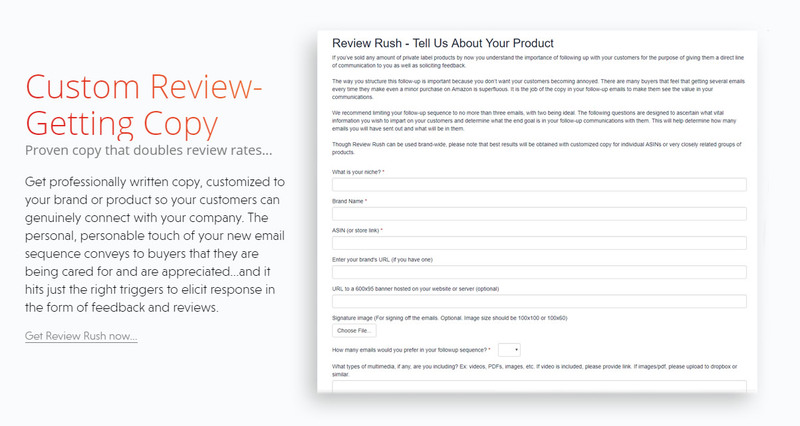 Our copywriting services for both Optimize and Review Rush are per ASIN. No subscription is required to use these one-off service. 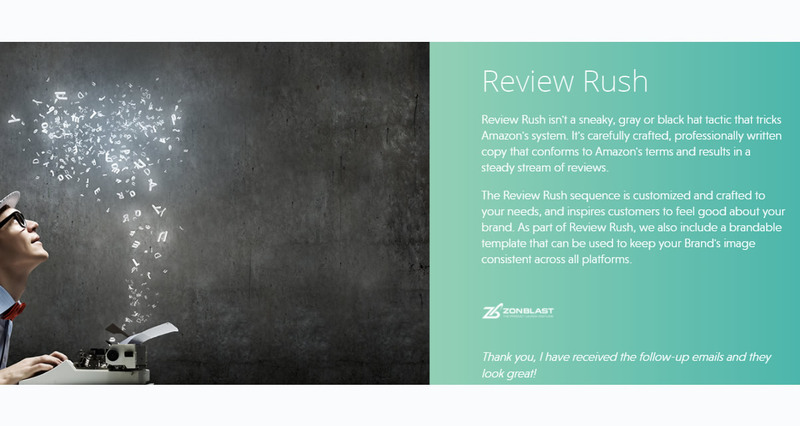 However all ZonBlast 3.0 subscribers gain access to unpublished discounts of our Optimize and Review Rush services. If you are subscribed to ZonBlast 3.0 and would like to engage us for copywriting services, get in touch with us via your SixLeaf Dashboard. To cancel a subscription to any of our tools, simply click the contact button at the bottom right hand corner of your SixLeaf Dashboard before your next billing date and we will take care of your request. 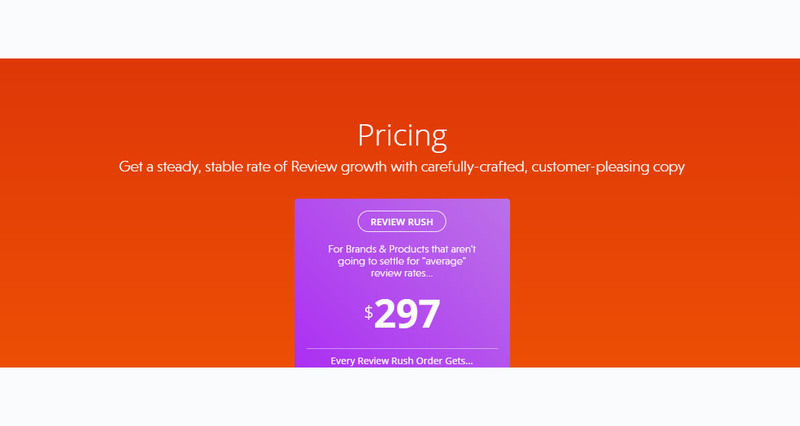 Our Build lineup of services (Optimize and Review Rush) are eligible for a full refund within 30 days provided the deliverables that had been issued are returned, and that usage of those deliverables ceases upon refund. We don't have wiki content for SixLeaf yet. Are you familiar with SixLeaf? Please quickly share in your own words what SixLeaf is all about! Share in your own words what SixLeaf is all about.